Pangolin (pronounced pang GOH lin) is a strange animal inhabiting the warm parts of Asia and Africa. Pangolin are perhaps better known as “scaly ant-eaters,” for they are just that. 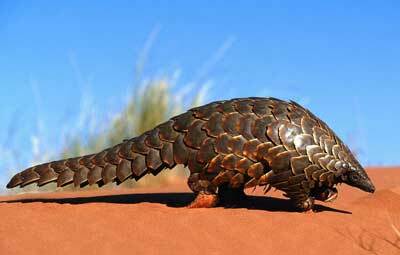 The pangolin’s body is covered with sharp, horny scales that give the animal the appearance of a large pine cone. The pangolin wanders about at night in search of anthills and termite nests, which it rips open with its strong, sharp claws. Then it pushes out its sticky, wormlike tongue which may be a foot long. It licks up the ants it uncovers and slurps the ants into its toothless mouth. It may eat many thousands of ants at one meal.